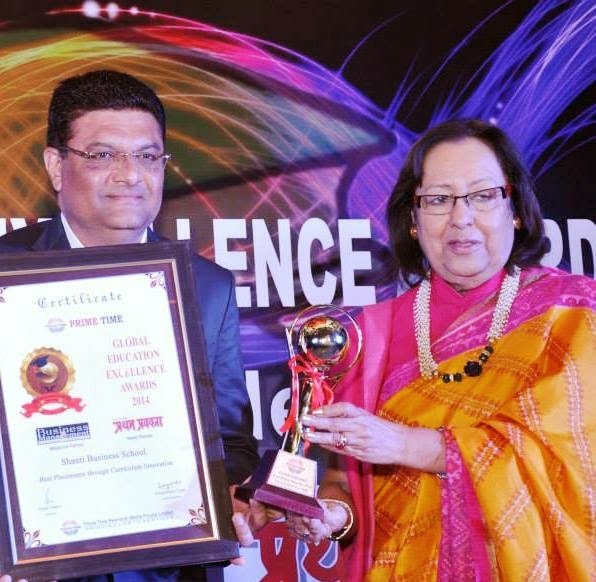 Shanti Business School Wins National Honour For Placements. Shanti Business School (SBS) has been conferred with the ‘Best Placements through Curriculum Innovation’ award for its outstanding achievement in terms of placements at recently held ‘Global Education Excellence Awards’ 2014 at New Delhi. Dr. Kishor Barad, Director, SBS was invited for the award ceremony held at Delhi and was awarded the trophy and certificate by Dr. Najma Heptulla- Honorable Member of Parliament, Rajya Sabha. Shanti Business School has always been excellent in terms of delivering quality education through innovative curriculum and amazing faculty mentors supported by excellent pedagogy. 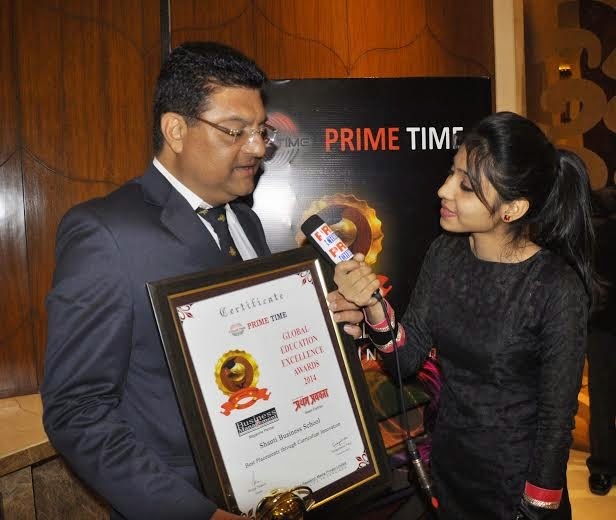 Prime Time Research Media Private Limited, a leading global, insight driven media Services Company, widely recognized for its pioneering and innovative work for its myriad clientele held an award ceremony- Global Education Excellence Awards (GEEA), 2014. GEEA is a small token of appreciation to honor the Achievers, Innovators and Leaders of the education sector. The event is a conglomeration of the elites to celebrate and felicitate excellence, reputation and exemplary work in the Education Sector in a spectacular style. This event recognizes and awards the educational institutes for their ability to steer objective through turbulent times, applying the best of the professional modules to manage and keep their missions afloat. The recipients of the awards are visionaries behind today's outstanding education system. They are stellar individuals and organizations who epitomize strength, ingenuity, knowledge, foresight and who drive the growth of the sector with vision and inspiration. SBS always has focused on upcoming industry trends and rising techno functional domains. One of the key differentiators of SBS leading to such an excellent placement track record is the never before curriculum offering 300+ electives like Digital Marketing, Corporate Governance, Investment Banking, International Marketing, E-Retailing, Strategic Finance Management, Security Analysis & Portfolio Management, Creativity & Innovation etc. This innovation in curriculum has attracted industries from domains like FMCG, Banking & Finance, Business Analytics, Consultancies, IT, Pharma, Media Houses, Healthcare, Manufacturing, Retails, Automobiles etc. to source their manpower from. Powerful Multinational Corporations like Coca Cola, Vodafone, Tata Consultancy Services, Future Group, SNL Financial, Reliance Communications and many more have been regular visitors to SBS for placements. In fact, certain industry majors like Millward Brown, WaterHealth, Minotti, Uninor, OOD Life, etc exclusively recruit from SBS for their Gujarat staffing. This has resulted in 100% placement track record for successive years since its inception which included 1065 job openings in 108 companies for PGDM batch 2010-12 and 1132 Job openings in 133 companies for PGDM batch 2011-13 with stipends ranging from Rs. 15,000 to Rs. 62,500 per month. · Dr. Balchandra Mungekar- Honorable Member of Parliament, Rajyasabha. · Shri Amar Singh, Honorable Member of Parliament, Rajyasabha. GEEA are the definitive awards celebrating the spirit of excellence in education sector across the globe. These awards intend to inspire others towards bigger and better achievements.